Unusual! Texas residents were shocked to meet a strange fish from the family of the peculiar mermaids; however, others confused it with a Christmas tree. There is no doubt that nature is an inexplicable world that never ceases to amaze us because of the strange species that emerge, and that experts are in charge of finding their origin. As it is the case, of the aspect of a new species of salamanders located in three places in the states of Florida and Alabama by a group of biologists. They claim that it looks like a mermaid. The state University of Sul Ross ( Texas ), whose scientists are co-authors of the discovery have placed their colleagues and the whole world in shock, after showing the appearance of reptile. 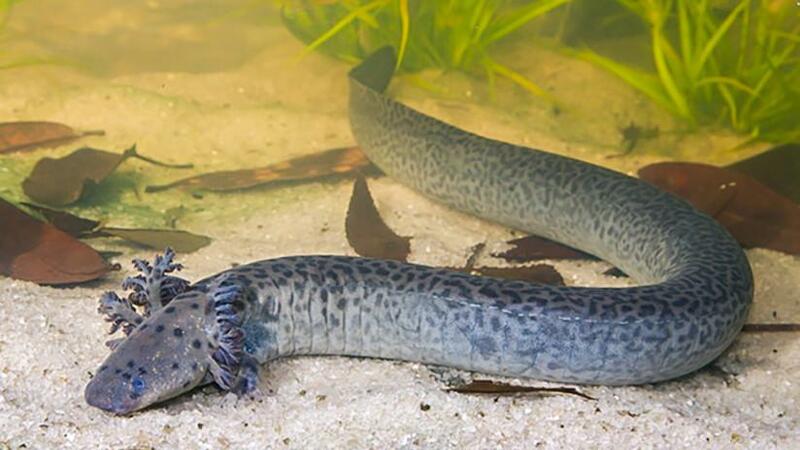 The neighbours called these amphibians “leopard eels”, due to the dark spots that cover their skin; However, experts have stressed that it should not be called that way, because the animal is not a fish. Once their image was disseminated through social networks, users began to compare the animal with a Christmas tree . However, what few know is that these species of ramifications serves for the animal to breathe. Unlike the leopard eels, this animal is characterised by having two front extremities, but not later and can be up to one meter long. Being a species discovered in nature, the scientists called it a reticulated siren (Siren reticulated in Latin) and it has been described in detail in an article published this Wednesday in Plos One magazine. Why that name? According to science, it has the genes of the species called sirens whose genome has been sequenced. What is known is that its habitat is very restricted: rivers, lakes to the extreme northwest of Florida and southern Alabama . “Not only could we meet such an interesting new species, but we also knew another reminder that the book of life still has pages to write,” said Texan biologist Sean Graham.